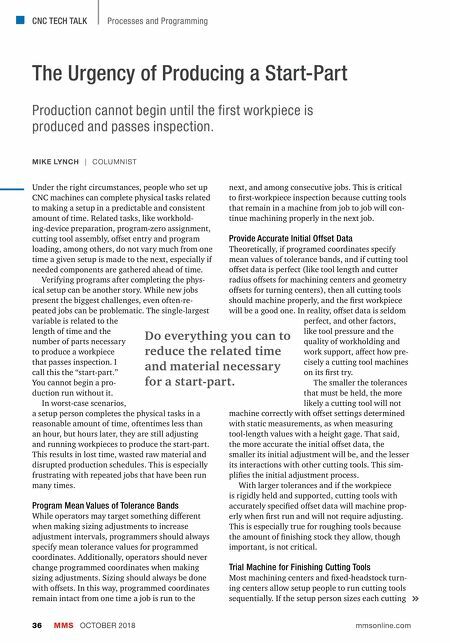 CNC TECH TALK MMS OCTOBER 2018 36 mmsonline.com Processes and Programming The Urgency of Producing a Start-Part MIKE LYNCH | COLUMNIST Production cannot begin until the first workpiece is produced and passes inspection. Under the right circumstances, people who set up CNC machines can complete physical tasks related to making a setup in a predictable and consistent amount of time. Related tasks, like workhold- ing-device preparation, program-zero assignment, cutting tool assembly, o•set entry and program loading, among others, do not vary much from one time a given setup is made to the next, especially if needed components are gathered ahead of time. Verifying programs after completing the phys- ical setup can be another story. While new jobs present the biggest challenges, even often-re- peated jobs can be problematic. The single-largest variable is related to the length of time and the number of parts necessary to produce a workpiece that passes inspection. I call this the "start-part." You cannot begin a pro- duction run without it. In worst-case scenarios, a setup person completes the physical tasks in a reasonable amount of time, oftentimes less than an hour, but hours later, they are still adjusting and running workpieces to produce the start-part. This results in lost time, wasted raw material and disrupted production schedules. This is especially frustrating with repeated jobs that have been run many times. Program Mean Values of Tolerance Bands While operators may target something di•erent when making sizing adjustments to increase adjustment intervals, programmers should always specify mean tolerance values for programmed coordinates. Additionally, operators should never change programmed coordinates when making sizing adjustments. Sizing should always be done with o•sets. In this way, programmed coordinates remain intact from one time a job is run to the next, and among consecutive jobs. This is critical to first-workpiece inspection because cutting tools that remain in a machine from job to job will con- tinue machining properly in the next job. Provide Accurate Initial Offset Data Theoretically, if programed coordinates specify mean values of tolerance bands, and if cutting tool o•set data is perfect (like tool length and cutter radius o•sets for machining centers and geometry o•sets for turning centers), then all cutting tools should machine properly, and the first workpiece will be a good one. In reality, o•set data is seldom perfect, and other factors, like tool pressure and the quality of workholding and work support, a•ect how pre- cisely a cutting tool machines on its first try. The smaller the tolerances that must be held, the more likely a cutting tool will not machine correctly with o•set settings determined with static measurements, as when measuring tool-length values with a height gage. That said, the more accurate the initial o•set data, the smaller its initial adjustment will be, and the lesser its interactions with other cutting tools. This sim- plifies the initial adjustment process. With larger tolerances and if the workpiece is rigidly held and supported, cutting tools with accurately specified o•set data will machine prop- erly when first run and will not require adjusting. This is especially true for roughing tools because the amount of finishing stock they allow, though important, is not critical. 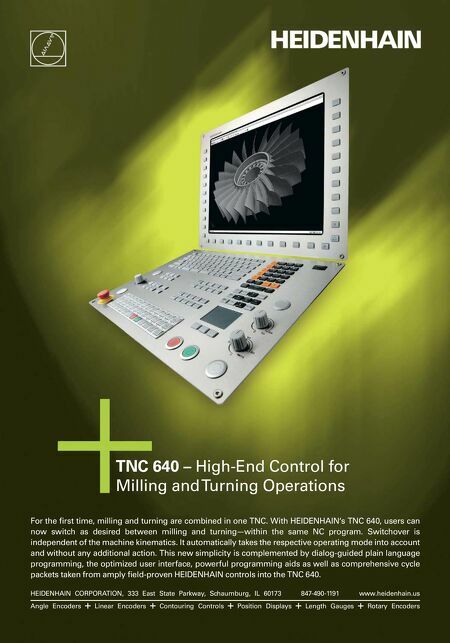 Trial Machine for Finishing Cutting Tools Most machining centers and fixed-headstock turn- ing centers allow setup people to run cutting tools sequentially. If the setup person sizes each cutting Do everything you can to reduce the related time and material necessary for a start-part.